Readers in Bristol and Somerset will get exclusive chances to meet hotly-tipped new author Gavin Extence at special events on 12 June at Bristol Central Library and Glastonbury Library, where he will read from his debut novel The Universe Versus Alex Woods, answer questions about his work, and sign books. These special library events celebrate the success of a month-long ‘Big City Read’ of The Universe Versus Alex Woods, which is based in Somerset. The ‘Big City Read’ has encouraged as many local people as possible to read and review free copies, thanks to a partnership between The Reading Agency, publishers Hodder & Stoughton, Bristol City Council’s and Somerset County Council’s library services and local book shops. (Please see ‘Notes to editors’ for full event details.) They also follow the recent announcement that Gavin and his novel have been shortlisted for the annual Desmond Elliott Prize, which champions the best in debut fiction. Since mid-May onwards, to coincide with the UK paperback edition launch on 9 May, a range of ‘Big City Read’-related activities have taken place across Bristol and Somerset. 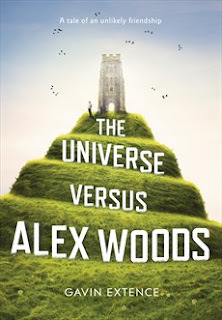 For example, in Somerset five book groups are now reading and discussing The Universe Versus Alex Woods, and Bristol libraries report readers of the free books eagerly returning to reserve places at the finale event as soon they'd finished reading their copy. This ‘Big City Read’ has been brokered by national charity The Reading Agency. The charity brings together its partners from the publishing world and the whole of the UK public library network to create successful and exciting events and activities for readers. “I’m really looking forward to these finale events for the Bristol and Glastonbury Big City Read project, particularly because the book is set in and around the area – and because I have no possession I value more than my library card,” says author Gavin Extence. Rights to his debut novel The Universe Versus Alex Woods, which chronicles the adventures of unlikely teenage hero Alex Woods, have already been sold in countries including China, Italy, Germany, Netherlands, Spain, Taiwan, Israel, France, and the USA, and the hardback edition has received widespread critical acclaim (Please see “Notes to editors” for reviews). Gavin Extence was born in 1982 and grew up in the village of Swineshead, Lincolnshire. From the ages of 5-11 years, he enjoyed a brief career as a chess player, winning numerous national championships and travelling to Moscow and St Petersburg to pit his wits against the finest young minds in Russia….where he won only one game. Gavin is currently working on his second novel. When he is not writing, he enjoys cooking, amateur astronomy and going to Alton Towers.